Chennai, April 1: Chennai Super Kings rode a valiant innings by skipper Mahendra Singh Dhoni and dominated with both bat and ball to defeat Rajasthan Royals by eight runs in their Indian Premier League (IPL) match here on Sunday. Batting first, Chennai posted a challenging 175/5, powered by Dhoni's undefeated 75 which rescued the hosts from a difficult situation. CSK beat RR by 8 runs | Chennai Super Kings vs Rajasthan Royals Live Cricket Score 12th T20 Match. Deepak Chahar, Shardul Thakur, Imran Tahir and Dwayne Bravo claimed two wickets each. 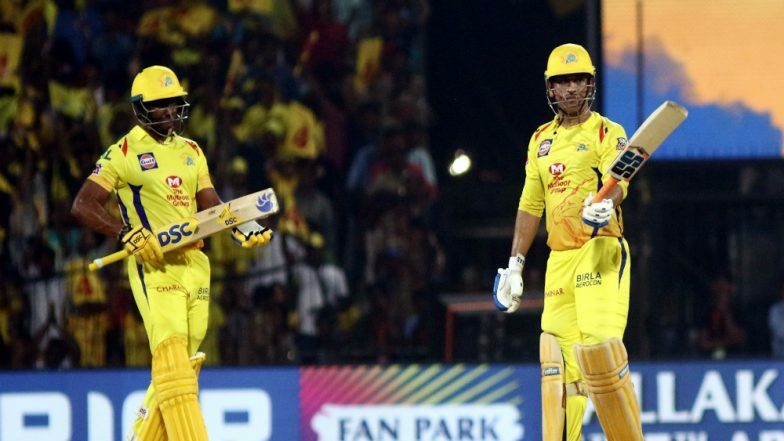 CSK vs RR Stat Highlights IPL 2019: MS Dhoni, Bowlers Hand Chennai Super Kings Third Consecutive Win.